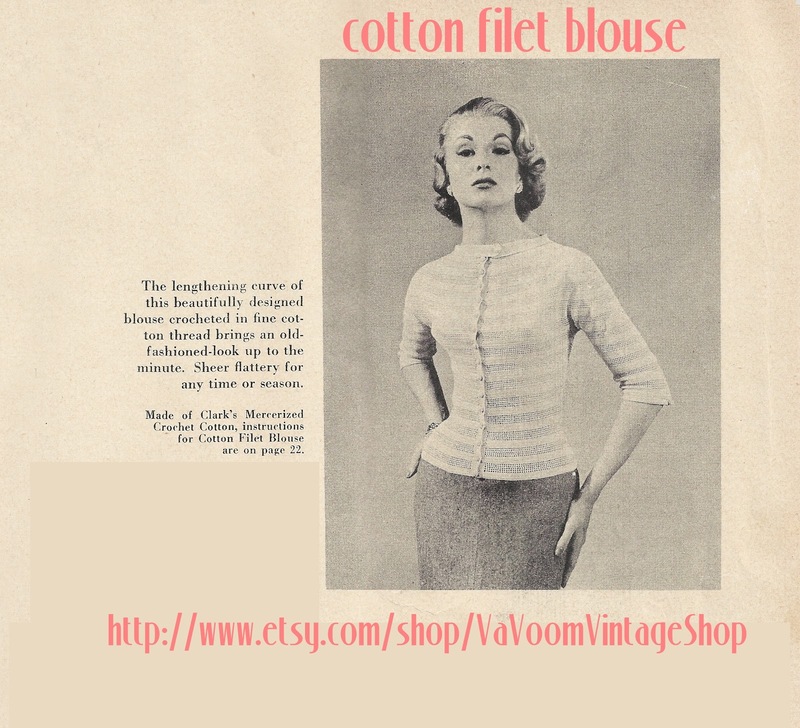 It's been a busy week so far but Va-Voom Vintage Shop on etsy is finally open! I'm starting with listing my collection of knitting and crochet patterns from my vintage magazines and booklets. Crochet patterns include a 2 page instruction sheet with basic crochet patterns from a 1955 crochet magazine. I love the complexity and beauty of knitting but crochet is a great place to start if you're new to needle arts. My great grandma taught me to crochet when I was a teenager and it is so relaxing. Unlike knitting, which takes me ages to complete, crochet usually gives instant gratification for impatient crafters like myself. Here are a few of my favorite crochet patterns, just listed in the shop. 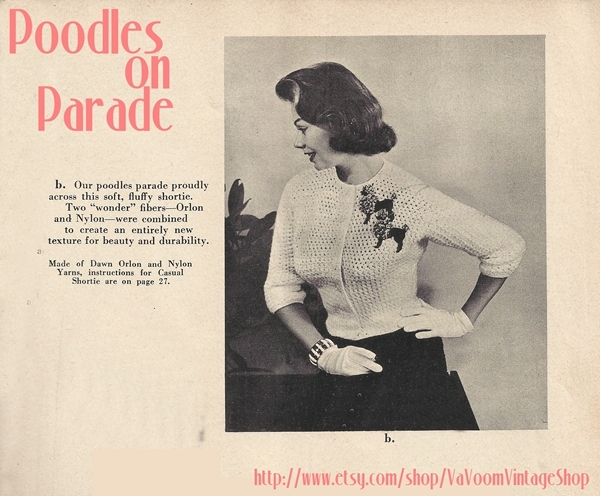 Poodles on Parade Cardigan I must find time to crochet this one soon. Poodles are so kitschy and fun! I'm thinking baby blue with black poodles and metallic or beaded details...maybe a monogram in place of poodles. I just love it! 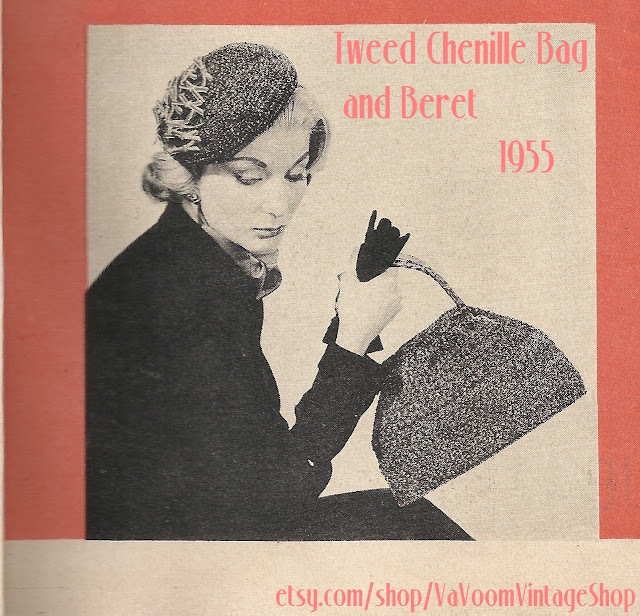 I really adore the spray of tiny velvet bows across the top of this hat. Unlike many tiny vintage purses, this handbag is a decent size to hold all of your modern needs. This blouse is so stunning. 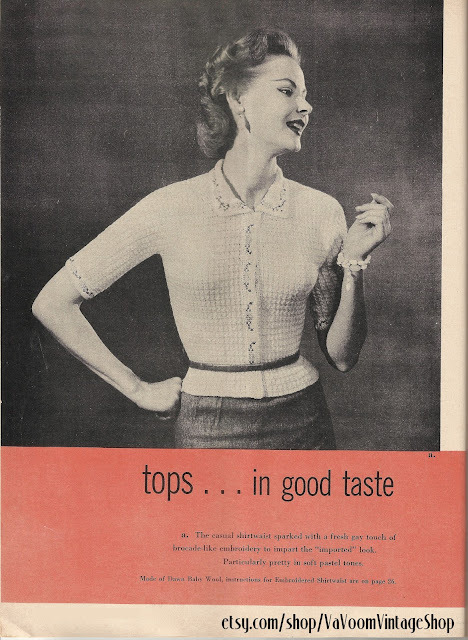 It would be beautiful with a 50's full skirt or even with modern trousers. How awesome is this dress? I saw a crocheted dress made from doilies a while back and have been wanting a crocheted summer dress ever since. I think it would be a great project to do over the winter. One thing I always consider before investing a lot of time in knitting or crocheting a garment is "how often will I actually wear it?". This cardigan is a perfect example of a handmade item that you can wear with ease and it mixes well with a vintage or modern wardrobe. And I can't say no to anything with a cute collar. I'll be posting weekly updates with new arrivals including pdf and paper patterns, vintage clothes and accessories. You can also be the first to know about new listings via facebook and twitter. Thanks for looking! That's awesome, sweet gal! Tons of congrats on launching your shop - I wish you unbridled success with it! You would love this, I found a crochet pink cardigan and matching beret for my daughter yesterday at the thrift shop. The sweater also included buttons, yarn and some crocheted pieces to finish the project, to bad I don't know how to finish it. I may have to send some photos to get ideas on how to add the buttons. I love the sweater with the poodles! 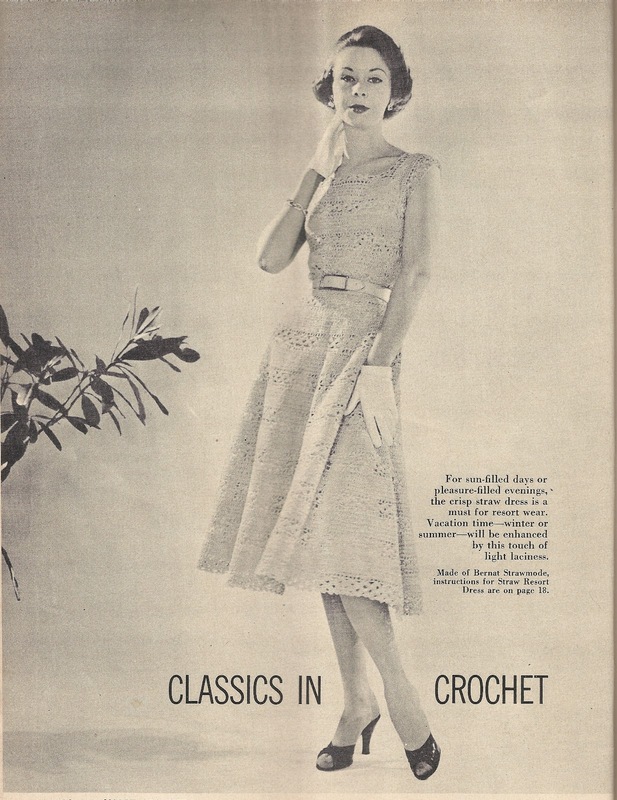 I'd love to be able to crochet well enough to make a presentable garment. Right now my skills are maxed out at blanket/throw level...straight lines are my friends! I'm convinced that i could do it with some practice, though...thanks for the inspiration! I'll add your Etsy shop to my favorites! I want to crochet a sweater but I want something fitted and simple. What's a good beginner pattern? Do you rate them in the shop?